Fantastic Voyage's 2015 release of Soul For Dancers proved so successful, that they didn't have to think twice when Lois Wilson (Mojo, Record Collector) asked if she could do it all over again. It turns out that there were plenty more classic sides in her DJ crates, drawing on that rich seam of early soul and proto-soul rhythm & blues, of the sort that would have packed the dancefloors on the sixties club scene, or has been embraced by subsequent generations of club soul diehards. Lois's latest wide-ranging selection, Soul For Dancers 2, makes welcome forays into the unique New Orleans sound (including a storming sequence of Chris Kenner, Jessie Hill and Lee Dorsey), samples Memphis imprints Satellite and Stax (including a brace of Mar-Keys instrumentals), and stays in the groove for Oscar Brown Jr's vocal take on Nat Adderley's Work Song. Elsewhere the 60-track 2CD set makes space for early Tamla sides by The Marvelettes and Marvin Gaye, and tips its hat to big guns such as Bobby Bland, The 5 Royales, Solomon Burke, James Brown and Jackie Wilson. Lovers of Lois's Ain't Gonna Hush: The Queens Of Rhythm & Blues, will be pleased to see that female vocalists are well represented here, with Ann Cole leading the charge with four tracks, a hat trick from Lula Reed, two each from Etta James, Mitty Collier and Marie Knight, plus contributions from Tiny Topsy, Della Reese and Barbara George, as well as Tina Turner in the company of her old man, and Ruth Brown, both solo and in duet with the peerless Clyde McPhatter. The first volume of Soul For Dancers prompted Shindig to observe "you can almost breathe that rarefied mod club atmosphere", and the set elicited 4-star reviews from Echoes, Soul & Jazz & Funk, and Record Collector, the latter remarking "no let-up in quality…you can't sit down". 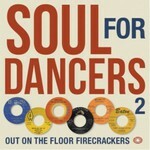 Well, be prepared to take to the floor again, as Soul For Dancers 2 weaves its magic.